DC scored another huge hit with Shazam last weekend, which opened to an impressive $53 million at the box office. 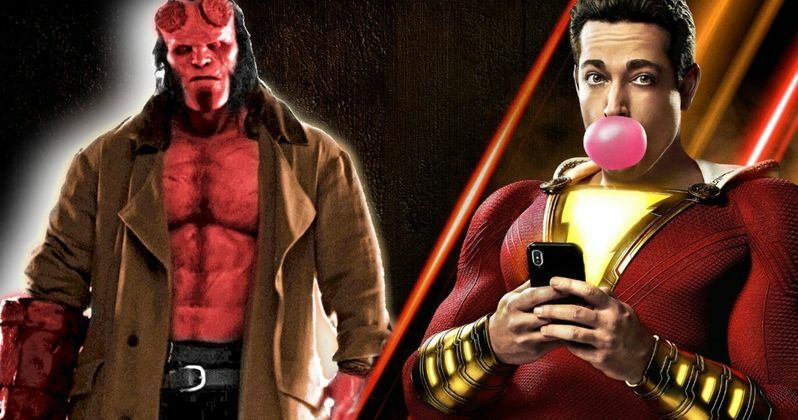 This weekend, Zachary Levi's caped hero is going to face some stiff competition in the form of Lionsgate's Hellboy reboot, another comic book franchise that is looking to get back on its feet after more than a decade. Laika also has their stop-motion animated Missing Link debuting this weekend, alongside Universal's comedy Little and Aviron's romantic drama After. Shazam! looks to win its second weekend with a take of between $25 and $30 million. Word of mouth has been very strong for this one, which comes from director David F. Sandberg. Warner Bros. is feeling confident, as they've already started working on a script for the sequel. So it's good for them that the movie should hold over quite well from week-to-week before Avengers: Endgame arrives later this month to decimate everything in its path. Meanwhile, Lionsgate has a very different situation going on with Hellboy, which stars David Harbour as the titular character. This reboot, which comes from director Neil Marshall (The Descent), is doing very poorly with critics so far, as it currently boasts just a 9 percent approval rating on Rotten Tomatoes, as of this writing. Still, it's tracking between $14 and $20 million and should take the number two spot at the box office. But it's holdover potential isn't looking great and that could mean this new version of the franchise is already dead in the water. Elsewhere we have Little, which stars Issa Rae, Regina Hall and Marsai Martin in what is, more or less, a gender-swapped take on Big, except it's an adult becoming a kid. This one is tracking in the $14 to $18 million range and, considering this doesn't carry the budget of a major superhero movie, that would serve as a very solid start. As for Laika's latest, Missing Link boasts a solid voice cast that includes Hugh Jackman, Zoe Saldana and Zach Galifianakis. The animated take on the bigfoot legend should make the top five, as it's tracking between $8 and $12 million. Critics, so far, have largely enjoyed this one, as it currently sits at a solid 89 percent on Rotten Tomatoes. This weekend's other new wide release, After, which is a young adult flick centered on a college student who falls for the resident bad boy, is looking to debut with between $3 and $7 million. Elsewhere, the Pet Sematary remake, which opened last week, should also hold onto a spot in the top five with around $10 million. Be sure to check out our full list of weekend box office predictions below and check back with us on Sunday for a full list of estimates. These numbers were provided by Box Office Mojo.